Todd, Michelle and their 8 children are performing their original Christmas musical entitled, “Simply Christmas”, at the Circle B Theatre, from November 1 through December 31. The family travels and lives in their bus, performing all over the United States and Canada during the rest of the year. But, beginning November 1, they bring their harmony and humor to Branson. “Everyone in the family participates in the show. Even our three-year-old has his own solo. The children are so talented; I’m always amazed at their musical abilities,” says Todd. “Our family will take you on a musical journey through Christmas past. At our Christmas party you’ll be visited by The Three Scrooges, Alvin and the Chipmunks, George and Martha Washington, just to name a few,” says Michelle. Come see us this Christmas. We can’t wait to celebrate the holidays with you! For Immediate Release. For more Information or pictures, contact Todd Allen at 269-903-8106.
helping Single Moms at the third annual run/walk at Silver Dollar City to benefit The Caring People. To make it even more unique, the event takes place after park closing during Old Time Christmas, immersing participants in the glow of millions of lights along the pathway of the 5K run/walk. “Last year we had an overwhelming, sold-out response with over 1284 participants. We’re even more excited about this expanded, Christmas-spirited event this year!” said founder JoDee Herschend of the Caring People, an organization reaching out to hundreds of single mothers in the Ozarks and internationally. JoDee said proceeds will help fund the organization’s Care Groups to work with single mothers and their kids in the Springfield and Branson area. Run to the Lights, sponsored by Elite Automotive Group and Silver Dollar City, will include a special lighting of the Special Effects Christmas Tree, carolers singing holiday favorites, and Silver Dollar City’s famous Christmas treats. Each participant will receive a long sleeved t-shirt and a day pass to Silver Dollar City that can be used during the remainder of the 2008 season. Registration is limited to 1,400 participants. For more information, visit www.thecaringpeople.org. Run to the Lights begins at 10:00 p.m. Friday, November 7. If you would like to schedule an interview with JoDee Herschend, founder of the Caring People, or with Cindy Shorey, Chief Operating Officer please call 417.334.0131. For the twelfth year the Welk Resort Branson will host the traveling Vietnam Veterans Memorial, known as “The Wall,”.during the 2008 Veterans Homecoming celebration This moving tribute to our fallen and missing Vietnam Veterans will be open to the public for viewing at the Welk Resort Branson, November 5 through November 11, 2008. A special locator book will be available to assist visitors in finding specific names. This official half-scale replica of the Vietnam Veterans Memorial, the most visited memorial in Washington, D.C., spans nearly 240 feet in length and lists the more than 58,000 names of the nation’s fallen heroes in the Vietnam conflict. in honor of our Veterans during our Veterans Homecoming Week Celebration. A special opening ceremony for “The Wall”, will be held at the Welk Resort on Tuesday, November 5, at 10:00 AM. As is customary, the names inscribed on the wall will be read aloud throughout the seven-day period. The Welk Resort welcomes any volunteers wishing to read, the names and hometowns of the more than fifty-eight thousand Americans whose names are inscribed on “The Wall”. Normally readers are asked to read for at least 30 minutes. Please call the Welk Resort at 417-336-3575 ext. 118 or call 800-505-9355. There will also be a POW/MIA Service of Tribute and Remembrance held at The Wall at 8:00 AM on Friday, November. 7. The Lee Greenwood-Bellamy Brothers schedule covers six weeks: September 14th through October 24th. Performance times will vary from 2 & 8 p.m. daily, excluding Sunday. Prices range from $43.50 (elite seating) to $39.50 (adults) and $19.25 for children, and are available by phone at 417-337-7469 or on-line at WelkResortBranson.com. Discovered by Mel Tillis’ road manager, Larry McFaden, Lee Greenwood has seven #1 hits and 23 Top-Ten records including “Dixie Road,” “Ring On Her Finger, Time On Her Hands,” “Hearts Aren’t Made To Break (They’re Made To Love),” “Going, Going, Gone,” and “God Bless The USA.” In addition to his solo hits, Greenwood has recorded a number of popular duets with Barbara Mandrell, including the chart topping single, “To Me.” Greenwood has received Top Male Honors with a Grammy Award, CMA Award and an Academy of Country Music Award. Because of his patriotic work during the 1991 Gulf War, he was awarded a Congressional Medal of Honor Society Patriot Award and a Points of Light Foundation Award. One of the most popular and widely recognized country music duos, The Bellamy Brothers have charted fourteen #1 singles including “Let Your Love Flow,” “If I Said You Had A Beautiful Body (Would You Hold It Against Me),” and “Redneck Girl”. The Bellamy Brothers first made an impression on the music industry when they wrote the smash hit “Spiders & Snakes,” recorded by Branson’s own Jim Stafford. The Bellamy Brothers have many accolades to attribute to their names. They hold the record in both the Academy of Country Music (ACM) and the Country Music Association (CMA) for the most duo nominations. After 30 years of success in the Country Music Business the Bellamy Brothers are coming to Branson to show a new generation of country music fans how it’s done. Branson, MO – Myer Hotels in partnership with Girl Scout Troop #244 of Branson recycled 1,632 telephone directories from each of the 5 Myer Hotel properties. As part of this effort a total of 47,000 books were collected by the entire Southwest Missouri Girl Scout Council of Dogwood Trails, Inc. 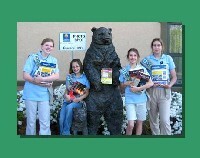 This effort helped raise funds for the Girl Scouts for each telephone book that they collected to be recycled. “We offer our customers numerous phone books and this was a great way to recycle the olds ones and help protect the environment and at the same time raise funds for Girl Scouts. It’s a great win-win for the community,” stated Gail Myer, Vice President of Operations. The phone books will be recycled by the Nestlé Purina® PetCare Company into Yesterday’s News® brand products. Branson Environmental Specialist Debbie Redford said recycling old phone books can make a big difference when it comes to the environment. For every ton of phone books recycled, 17 trees are saved along with 3.3 cubic yards of landfill space. For a visual image, a ton of phone books stacked on top of each other would be 120 feet high. Other items that Myer Hotels does to help protect the environment include a customer led sheet change program, a customer led towel reuse program, low flow shower heads and aerators, recycling plastic buckets through reuse by the Gift of Green tree planting program. Wherever possible, Myer Hotels also uses lower wattage fluorescent lights instead of incandescent lighting and they have two properties with energy management systems on HVAC systems and will install the third this coming winter. In the lodging business for 40 years, the Myer family has actively contributed to Branson’s hospitality market for over 25 years and received numerous national awards. Myer Hotels includes the Best Western Center Pointe Inn, Best Western Music Capital Inn, Comfort Inn at Thousand Hills, Comfort Inn & Suites Branson Meadows and Comfort Inn West. The properties emphasize excellent locations, countless amenities and exceptional customer service while focusing on great value in the upper mid-scale area. (Branson MO ~ Wednesday, October 15, 2008) Kirby & Bambi VanBurch, internationally renowned entertainers and illusionists, were honored with another special award, “Best Illusionist”, at the World Magic Awards 2008 in Santa Monica, California. The annual event was held on October 11 and was filmed for an upcoming TV special on MyNetworkTV. The World Magic Awards 2008 will air on Wednesday, November 26 from 7:00 to 9:00p.m. Check www.WorldMagicAwards.com for stations airing in your viewing area. In the Branson Missouri area, viewers will be able to watch thow on My31 (KWMB 31). The World Magic Awards 2008, hosted by Neil Patrick Harris, has a variety of guests and performers including Lance Burton, Dan Sperry, The Amazing Johnathan, Ed Alonzo, Kyle Eschen, Greg Gleason, Franz Harary, Hans Klok, Mark Kalin & Jinger, Topas, Sos & Victoria, Jeff McBride, Roxanne, and Florian Zimmer. Kirby VanBurch is known as the Prince of Magic and has received many awards including Entertainer of the Year from the International Magicians Society as well as Magician of the Year. Kirby & Bambi VanBurch perform live at their theatre in Branson, Missouri. The has been voted Best Branson Show, Best Magic Show, and received numerous other awards and accolades from fans and critics alike. Their show features exotic animals including white tigers, amazing disappearing acts, a helicopter appearing in 3 seconds flat, mind-reading, assistants cut in half, up close and personal illusions, and much more. For their Branson theare show schedule visit www.KirbyVanBurch.com. The Chicken House Opry, America’s fastest growing entertainment venue, has limited engagements at The Gene Williams Theatre in entertainment mecca Branson, Missouri. The show is at 2 PM each Friday and Saturday in September and October of 2008, through Saturday, November 1st. Not only does the show feature old time entertainment, but the admission price goes back to Branson of 30 years ago: $12 each or 2-for-$20, plus tax. The Chicken House Opry has gained national recognition as being the best buy in entertainment. Comedy skits such as ‘Thibodeaux’s Big War (vs Saddam Whosain), Ernesto and The Rancher; Boudreaux, Jole Blon and FEMA’ has please record crowds from deep south Texas to Canada. Award winning entertainers appearing on the show include Cajun comedian Charlie LeBlanc, Bob’ Punjo’ Reed, Lucy Jackson, Al Prosser, Alma Reed and Ike Thurn plus Simeon Magby, Jon Birkey, Junior Fulks and Dean and Char Greathouse. 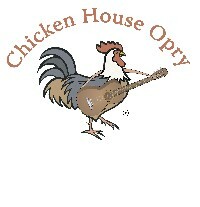 The Chicken House Opry, no doubt, should be on everyone’s ‘Must See’ list. The Gene Williams Theatre is located in the Branson Mall, next to the old Wal-Mart on West Hwy 76, Branson. Live Auction – Everyone Welcome!!! At Celebration City Pavillion on Saturday, October 25, 2008. Benefiting Children and Families in Stone and Taney County at Christmas and through Relational Ministries through Love In The Name of Christ (Love INC). Tickets to area attractions, hotel accommodations, Lead Crystal Domed Cake Plate, Black and Decker Home Project Kit, Restaurant Gift Cards, Lots of Miscellaneous Baskets, Books, Jewelry Carriers, Vases, Jewelry, Clothing, Hats, Purses, Watches, Yard Decor, Silk Flower Arrangements, Drill Set, Massage, Matted Calligraphies, Discounted Cruise and Air Travel, Lanterns, Breakfast with Branson Mayor Presley, Magazine Subscription, Stained Glass, Cordless Drill, Bed Scarf, Stepping Stone, T-Shirts, Prints, CDs, Throws, DVD Player, Oil Changes, Clock, 4 Rounds of Golf at Murder Rock and MUCH MORE! Meet the Children’s Author, William Lee Golden, member of the Oak Ridge Boys! Special Appearance by Author and Member of the Oak Ridge Boys, William Lee Golden on Oct. 14th 6:00-7:00pm at the Oak Ridge Boys Theatre. William will be signing his children’s book, “Noah Didn’t it Rain?” as well as signing special lithographs in limited edition just for this event! Don’t miss meeting this outstanding, creative author and beloved singer of the Oak Ridge Boys! (Branson, MO- 10/6/08) The Branson Veterans Task Force, a Branson, Missouri based, not-for-profit organization created to honour and support America’s veterans, announces that its newspaper, The Bugle, will now be available for viewing online at www.BransonVeteransBugle.com. Traditionally published in the Spring and Fall of each year, The Bugle’s print and online versions will continue to feature editorial and informational items relevant to the dozens of annual veteran’s events presented in Branson each year. •	Lt. Col. Oliver North (USMC-ret) will sign his new book at several locations and will deliver the keynote address at the 233rd US Marine Corps Birthday Ball on Monday, November 10 at Chateau on the Lake. Visit event sponsor Branson.com for details. For a listing of Veterans Homecoming events, special Homecoming visitor discounts, and Bugle subscription information, please visit www.BransonVeterans.com or www.BransonVeteransBugle.com.